There must be worse ones than this. I have heard stories about toilets that sounded worse. But as far as personal experience, this is the one that struck me at the time as being the most awful toilet. Why do I think that this one is so bad? I think we should expect so much better. It's the extreme disappointment factor that awards the prize to this one. Sure, you would expect bad toilets in places like Egypt or China or Russia. I encountered an awful underground public toilet in a park near Novodevichy Convent in Moscow. The "toilets" were knee-high stubs of culvert drainage pipes. The floor was covered in about an inch of ooze, and the atmosphere had an ammonia content about equal to that of Venus. Plus, this being Russia, one had to pay a fistful of Rubles for the privilege of visiting. But as I said, you have low expectations in Russia and it was no real shock. However, this one was in Greece. This is the train station, such as it is, in Nafplio, Greece. Really it's just a short covered platform and some old cars. Tickets are sold out of one of the old cars around the times that trains are scheduled to arrive. But we really don't expect much from Greek railroads, especially the narrow-gauge lines in the Peloponnese. And besides, I'm complaining about bad Greek toilets, not their trains. Greece was the home of logic and philosophy, and some would say it was the origin of Western Civilization. We would expect at least decent conditions. After all, this is the land of Plato, and Socrates, and Aristotle. Most of "Roman civilization" was really just stolen from pre-existing Greek culture and ideas. 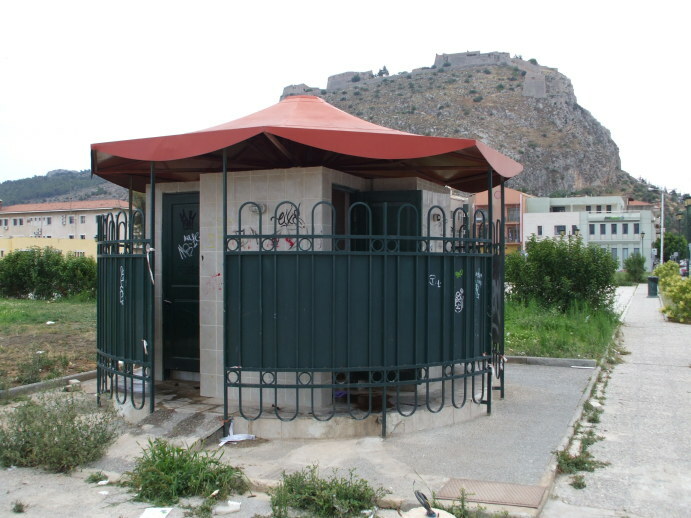 A δημοτικά τουαλέτα (demotika toualeta, or public toilet) is located near the Nafplio train station. As is usual in Greece, it's hard to tell. Signs are often completely obliterated by graffiti. As Greek signs go, this one is really in pretty good shape. The Greek economy is primarily based on graffiti and strikes. I want to see the awful picture. This δημοτικά τουαλέτα is a kiosk with four compartments, each with a squat toilet and sink. How did this win the title of Worst Toilet in the World? It was the savagery of the users. I could understand that a public toilet could get blocked and turn into a real mess. But as far as I could tell (and I didn't care to examine it closely), it wasn't blocked. 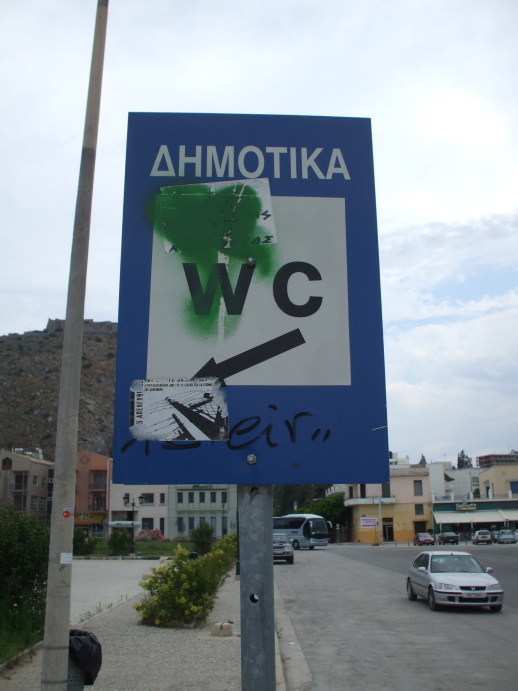 You see, the good people of Nafplio hadn't bothered to defecate in the toilet itself. The floor was splotched with several piles of human feces. Oh, you say, there must have been a mess in the bad compartment, something unusual must have happened there. No, all four were in this state. This is down by the train station and the waterfront, not too far from the bus terminal. Right where all the visitors can experience it. You will notice that this has the blue Sani-Flush border indicating that I used it. I stood outside and urinated in through the open door. Seriously, that could only help the situation.